We've all heard of the 7 Wonders of the World. And the 7 Natural Wonders of the World. And the 7 Wonders of the Ancient World. Sadly, Canada is represented in these famous lists only by the Northern Lights, which Greenland expects us to share. It's time for a list for the rest of us. We've all heard of the 7 Wonders of the World. And the 7 Natural Wonders of the World. And the 7 Wonders of the Ancient World. Sadly, Canada is represented in these famous lists only by the Northern Lights, which Greenland expects us to share. Hmm. While these are all amazing places, they lack one important feature -- places I have actually been. 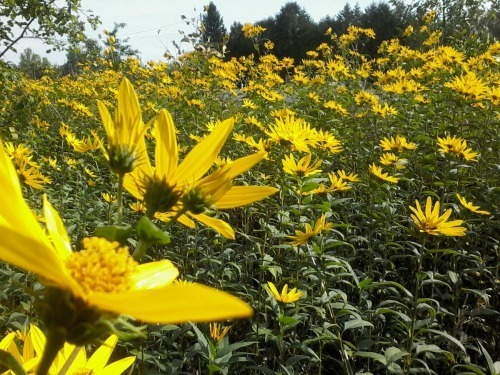 They also lack my field of sunflowers, which I assume did not qualify because it blooms for just three or four weeks a year. I like this list better, as it includes four places I have been or seen -- even if my field of sunflowers is still missing. Three places show up in all three lists -- Niagara Falls, Bay of Fundy and the Northern Lights -- but the lists are otherwise fairly unique. These are all amazing places, which you can take me to anytime you like. I am a little surprised that the Alberta badlands aren't on any of the lists. I am even more surprised that the Percé Rock is not on any of them, given that it is as iconic a natural image of Canada as Niagara Falls. 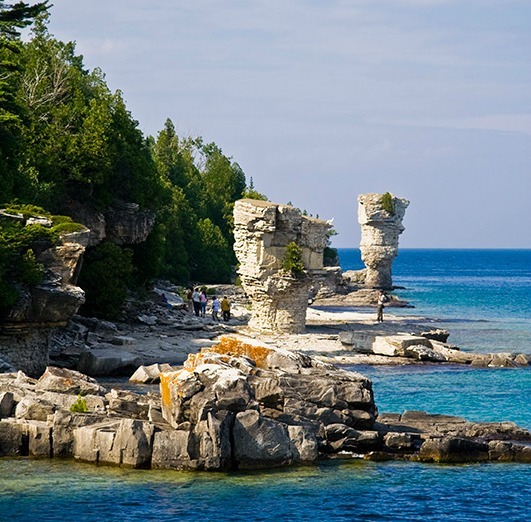 Flowerpot Island, near Tobermory on the Bruce Penninsula, in Ontario. Not so famous as its cousin on the Bay of Fundy, but you'll have to agree that it's pretty cool. Maybe even cooler than the Bay of Fundy. And such blue water! Capilano Canyon is so close to Vancouver that it is accessible to all. 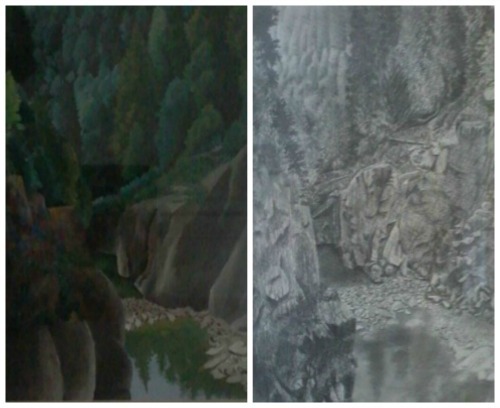 So much so, in fact, that I painted and drew a view of it four times. Ironically, as I was searching for lists, a Google Ad for BC Tourism, featuring the Capilano Canyon Suspension Bridge, stalked me from site to site. The bridge is fun to cross, because it is wobbly. 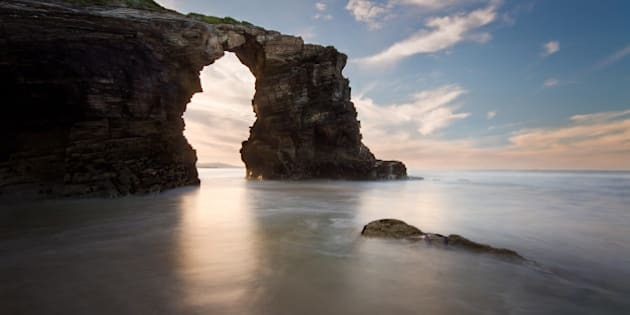 Some people are afraid to walk across, because they don't like foot bridges that sway with every step. I dare you to run across! Bird Island is nothing special, just a very rugged crop of rock jutting up from the water. But the birds on Bird Island sure are special. I was able to check one thing off my bucket list by taking a boat tour from near Sydney (Cape Breton Island) to this island. I saw puffins in the wild. Thousands of Puffins, in fact, popping in and out of their caves in the rock face. We also saw grey seals (not popping in and out of caves), cormorants and black herons strutting atop the rocks, and bald eagles flying overhead. Lusk Cavern, near Gatineau, Quebec, is to blame for me knowing the word "spelunking". The cavern is a pathway for a stream, and is divided in two, with a huge open-air gap between the two segments. The first half of the cavern can be walked through with natural light most of the way. In some spots, the water is only ankle deep. In other spots, be prepared to get wet. The second half of the cavern is completely dark. You can't see what you are doing as you climb down the underground waterfall. In the spring, when the water is high, you have to swim underwater to pass through one of the pools. 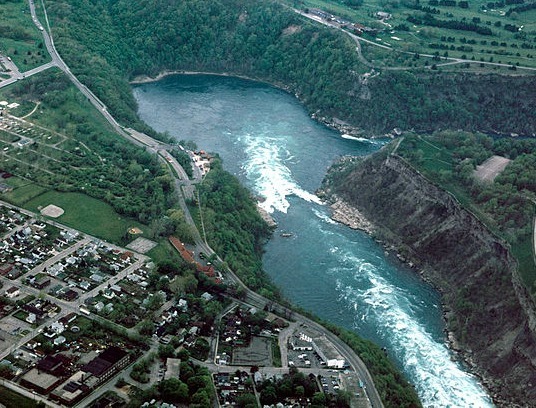 The Niagara Whirlpool is just downstream from the more famous Falls. It's not really part of the Falls, though, as it is 6 km away. So much water whirls in a circle as the flow takes a tight bend in the Niagara River. Red sand and red earth. If you live in PEI, you might wonder, "What's the wonder?" However, any place where sand is other than a dull grey-beige is pretty amazing to us mainlanders. Red, blue, purple - whatever colour. And the sand and earth in PEI are an amazing hue of red. High Falls is a natural water slide near Achray, in Algonquin Park (Ontario). People, this is fun! Well, that's seven, and I didn't even mention Elora Gorge or the local rock family. 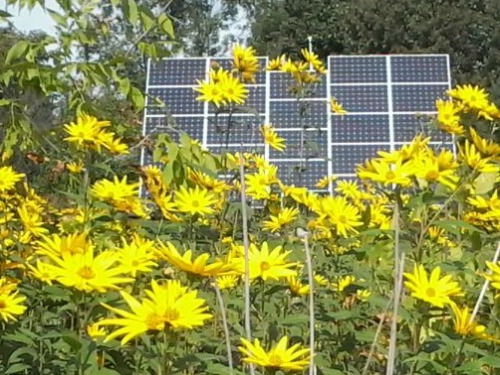 Or my sunflower field. Never mind, by the time you make plans to visit, the flowers will be gone. So I will leave you with a couple pictures to enjoy.